Spare a thought for poor Donald. He can’t build his wall. He is being out manoeuvred and outplayed by Nancy Pelosi over the Government shutdown and State of the Union address, and out-thought and outnumbered by the public over climate change. 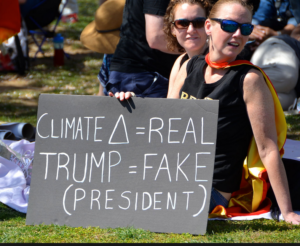 The latest findings by the Yale Program on Climate Change Communication and the George Mason University Center for Climate Change Communication reveal that “a large majority of Americans think global warming is happening, outnumbering those who don’t by more than 5 to 1”. Some 73 per cent of Americans now think that climate change is occurring – an increase of ten percentage points since March 2015. In contrast, only about one in seven Americans think global warming is not happening. The US public is also becoming more aware that it is caused by human activity. Sixty-two percent of the public now understands that global warming is caused by our activity. Furthermore, nearly half of the US population say they have personally experienced the effects of global warming, an increase of 15 percentage points since March 2015. Anthony Leiserowitz, director of the Yale program, told the New York Times that the results suggest that climate change has moved out of the realm of the “hypothetical” to the “real” for most Americans. Ironically, the more that Trump tries to dismiss the idea of climate change, the more the media cover it and the public gets concerned. “Every time he talks about climate change he drives more media attention to the exact issue,” Dr. Leiserowitz told the Times. Steyer was sharing an indepth and interactive article in the New York Times on how shrinking glaciers will cause a global water shortage. Climate scientist, Gavin Schmidt, responded with a series of tweets, one enclosing a temperature picture of Australia. As parts of the US freeze, America boils. They say that pictures don’t lie and the temperature picture of Australia shows the country gripped by high temperatures, with records being broken nearly every day, where dogs paws blister on the pavement, bats fall dead out of the trees and fish are being boiled in rivers. This is the future scientists warned us about and it has arrived. We have reached the time when no one will accept climate lies from Trump anymore. Understanding his lies and ignorance is one thing, but acting on them is another. As Oil Change pointed out last week in a major report, we cannot carry on drilling and have a safe climate. Trump is leading us towards climate disaster. And he doesn’t even understand the difference between the climate and the weather.